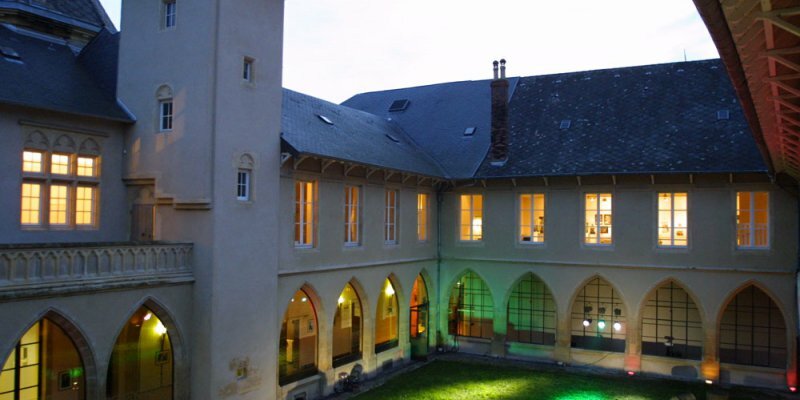 Located in the historic heart of Metz, the former Trinitarian Abbey is composed of several emblematic scenes that will give your events a spectacular dimension. There is a unique atmosphere revealed by the old stones in auditoriums that can accommodate 20 to 350 people. The Theatre Bar, in an original pop atmosphere, can accommodate 50 people for a cocktail / reception / coffee. The Cloître. Open space, located in the heart of the Trinitarians, this monument will enchant your guests thanks to its Gothic architecture and its inimitable atmosphere. This friendly place will give you the chance to enjoy a timeless moment and the celestial vault in a magnificient setting. Private meeting spaces. Different areas can be made available. The Pierre-Frédéric Klos Theatre is a room with intimate dimensions, with a tiered space and a stage. It makes it possible to organize a corporate event in the form of a show and thus surprise your guests thanks to this original theatre. The best thing to bring a stunning and staggering dimension to an event. PMR access to the different spaces and access to all the lines of the METTIS network to 100 m.